So in the past few weeks Darby Smart has been offering some amazing sales and as such I stocked up. STOCKED UP! One of the kits I got was the to DIY FOR box for December. Basically you get a surprise craft sent to you with everything you need to get the project done. And it turns out my kit was for the marquee sign. Now lit up letters are all of the rage just about everywhere so this project is on trend and lots of fun. Now you get a practice board which as it turns out I needed because I messed my first go up BIG TIME. It was going to say NOEL and be all Christmas-y and fantastic. But somehow I managed to get sharpie all over the side of my hand and when I went back over the letters, I smeared gray all over the board. Ugh. QUICK TIP – using masking tape will keep the letters down on the foam core but won’t ruin the surface when removed. So digging out my second piece of foam core (smarties over at Darby Smart know things like this happen!) and seeking out my N-O-E-L again two things popped out. G and $. Now you may not know this, but my big boy cat Gracie has a rapper name and that is GMunny often shortened to G$. This. Was. Fate. 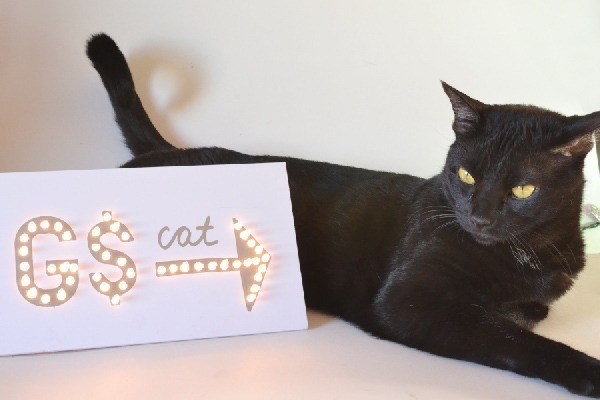 Now I never would have thought that out of all the cats he would be the one who needed a light up marquee, but who am I to argue with fate? Wow – that’s one popular sign, right? Now any of you who don’t have cats might think this looks violent but it’s not. Mar is the big boss around here and apparently took quite a shine to the sign and didn’t want Liddy rubbing her furry face all over it. This prompted Mar to go in for the BOP and when Liddy did not tuck tail and run immediately it was time to do an air-bite of LIddy’s ear. An air bite is when one of the animals acts like they are going to bite and snap their jaws just beside what they COULD have gotten. It’s like saying, I could have totally messed you up but I’m giving you one more chance. I just happened to snap the pics in quick succession and then just happened to crack up when sifting through pics to use for this post so the animated GIF was a total inevitability. Now here is the man of the hour. GMunny himself and guess what. 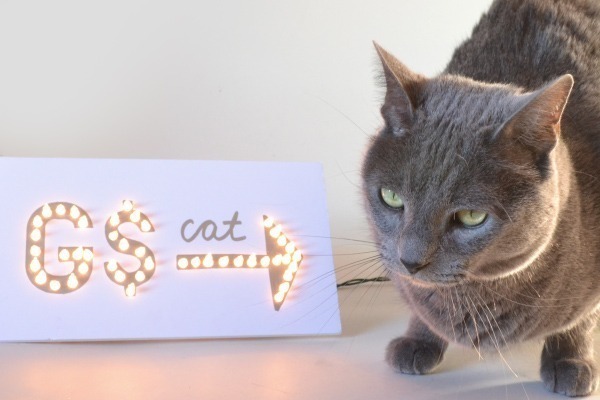 He doesn’t like the sign. Look at how put out he looks? 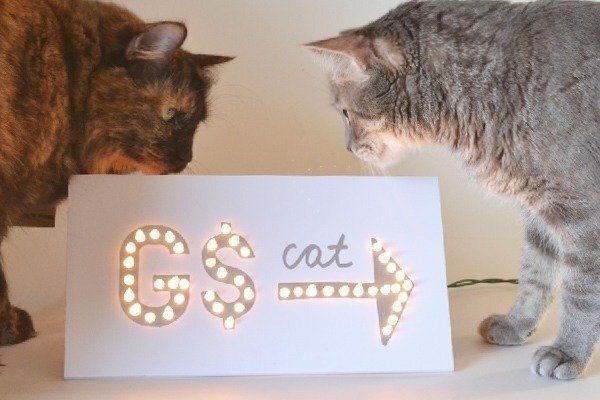 How many cats do you know have their own light up marquee announcing them? What a brat! Now Max can’t read but I don’t think he would care even if he could. When G vacated his spot, Max just plonked right on in. You can get the kit to make your own marquee sign or any number of awesome kits (perhaps the Rock Star Cuff kit or the block printing kit, both of which will be on this blog within the next month) head on over to Darby Smart. And guess what?! 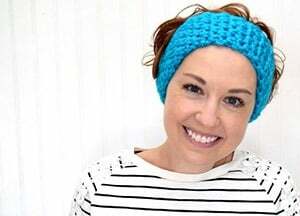 With each purchase you’re supporting this little ol’ blog because I’m a Darby Smart Affiliate these days!